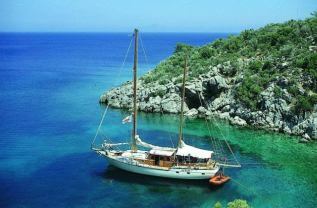 A gulet (pronounced ‘goolett’) cruise is, in our opinion, one of the best holidays ever to have been invented. It’s a wonderful combination of al fresco eating and drinking, swimming in a huge, crystal clear pool (the Med!) and, of course, cruising along one of the Mediterranean’s most beautiful and photogenic coastlines. 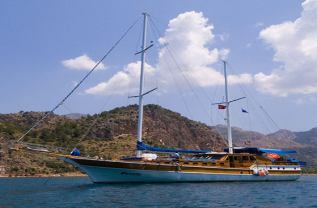 Add to all this a series of picturesque coves, magnificent scenery, snorkelling and sunbathing and you have the kind of unique holiday experience which can only be savoured on a Turkish and Greek gulet cruise. There are usually 6 cabins, all with sh/wc. There’s a sunbathing area with sun mattresses, a saloon / bar, a shaded afterdeck for meals and drinks, a music system, a galley and snorkels & flippers.